When it comes to cancer, the ability to pinpoint, isolate, destroy or remove dangerous cells is critical. It’s why our highly skilled teams of surgeons, radiologists, pathologists, oncologists and staff at Methodist Estabrook Cancer Center work tirelessly to find and implement the latest cancer-fighting technologies. And when new ideas are born, potentially life-saving clinical trials help our teams forge new paths for cancer treatment. In the fight against endometrial cancer, Methodist is leading the way with a clinical trial aiming to prove that a method for finding potentially cancerous lymph nodes is effective. In this case, a green dye may light the way for surgical oncologists. In the darkened Methodist Hospital operating room, all eyes were fixed on the video screens as an iridescent glow lit up the monitors. 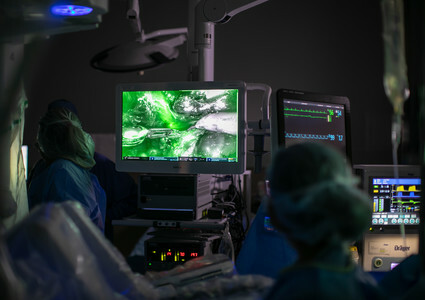 The pulsing green dye, seen through cameras that were aimed at the surgical field, looked like something out of a sci-fi film as two robotic arms snipped away at the edges. “And that’s the right sentinel node,” David Crotzer, MD, announced from the controls of the DaVinci surgical robot. The gynecologic oncologist at Methodist Estabrook Cancer Center's Midwest GYN Oncology Clinic then removed the tissue for biopsy. It was just the first part of a procedure that would help Vicki Brink beat cancer. Vicki made an appointment with Methodist Physicians Clinic OB/GYN William Weidner, MD, after experiencing some unexplained bleeding. At 73 years old, the only times she had ever been in the hospital were to have her babies. To say hearing the word “cancer” took her by surprise is somewhat of an understatement. “It’s been a little bit of a whirlwind,” Vicki said. Dr. Weidner delivered her a diagnosis of stage 1 endometrial cancer and referred her to Dr. Crotzer. As a specialist dedicated to the diagnosis and treatment of gynecologic cancers, Dr. Crotzer is no stranger to treating endometrial cancer like Vicki’s. In fact, he and his team are leading a clinical trial with the hope of solidifying a new standard of care. Their goal is to ensure doctors remove the cancer while helping the patient maintain a high quality of life. It all has to do with lymph nodes. Lymph nodes are an important component of our body’s immune system, attacking and destroying germs throughout our body in a watery fluid called lymph. The nodes work as tiny filters, getting rid of the bad and replacing it with good. But when it comes to cancer, this lymphatic network can also be a superhighway for disease to travel throughout the body. 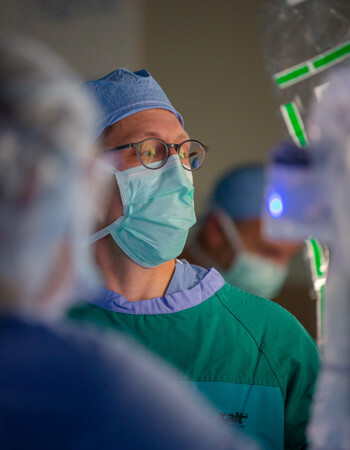 While it’s important to remove potentially diseased nodes, cancer specialists like Dr. Crotzer are doing what they can to save healthy ones. Sentinel lymph node mapping is a procedure in which an iridescent, green dye is injected near a tumor, with the intent of it being absorbed by nearby lymph nodes. “The idea is you inject the dye close to where the tumor is, and it will find the very first lymph node in that organ system,” said Brent Tierney, MD, a gynecologic oncologist at Methodist Estabrook Cancer Center’s Midwest GYN Oncology Clinic. He is also one of the experts leading the clinical trial. The first lymph nodes to be illuminated by the dye are known as sentinel lymph nodes – those that would be the first to carry and spread cancerous cells from a tumor. “Sentinel lymph node mapping is established as the standard of care for breast cancer, and it's been that way for a number of years. It's also the standard of care for melanoma,” Dr. Crotzer said. When it comes to endometrial cancer, the question hasn’t been whether sentinel lymph node mapping works – it’s researching how the lymphatic system works in that particular area of the body and whether mapping the nodes can actually pinpoint those that would be most affected by the disease. The clinical trial now underway hopes to prove that injecting the dye into the cervix is the best place to start. Similar trials have been done at institutions such as the Mayo Clinic and the University of Indiana, and researchers have gained valuable information. This clinical trial will ultimately look at patients who undergo sentinel lymph node mapping and full lymph node dissections. Today, nearly all endometrial cancer patients at Methodist – no matter their stage – have the option to join the trial and have their lymph nodes mapped. Even with a nonaggressive stage 1 cancer, Vicki was eager to join the study. 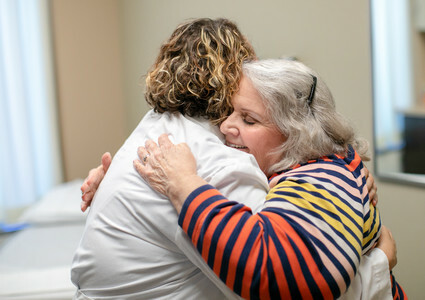 Methodist has long been a leader in offering clinical trials to patients, and providers appreciate the support Methodist has given them when it comes to advancing the science behind treating gynecologic cancers. “I find it really impressive that an institution like Methodist, which is not a large academic university, has such a robust and vibrant research program that really affords patients the opportunity to participate in clinical trials,” he said. They’re equally thankful to patients like Vicki, who help make changing the future of cancer care possible. Learn more about the clinical trials at Methodist. Katina Granger is a Content Strategist for Methodist Health System and is passionate about telling stories that illustrate The Meaning of Care.